Genova (from the Latin “Ianua”), is a portal between land and sea, a crossroads of cultures and people since ancient times. 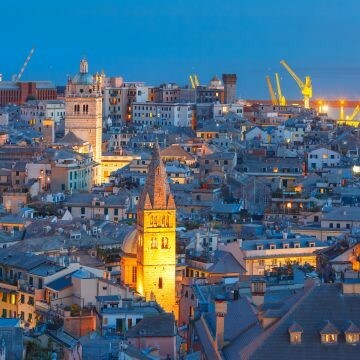 Located on the Gulf of Genova in the Ligurian Sea, Genova is the capital of the Italian region of Liguria and has historically been one of the most important ports on the Mediterranean: it is currently the busiest in Italy and in the Mediterranean Sea. 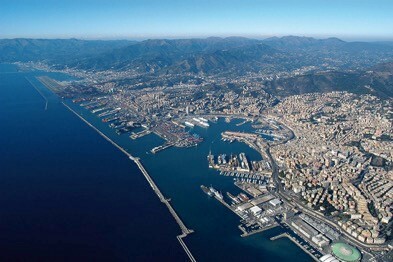 Genova has been nicknamed la Superba (« the proud one ») due to its glorious past and impressive landmarks. 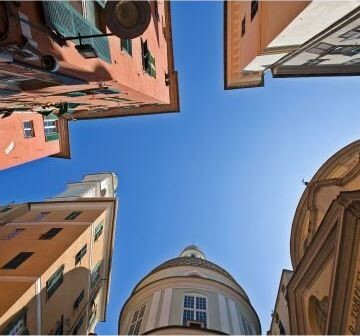 Part of the old town of Genova was inscribed on the World Heritage List (UNESCO) in 2006 as Genova: Le Strade Nuove and the system of the Palazzi dei Rolli. The city’s rich cultural history in art, music and cuisine allowed it to become the 2004 European Capital of Culture. It is the birthplace of Christopher Columbus, Niccolò Paganini, Giuseppe Mazzini and Renzo Piano among others. Today Genova is a living city, where elegant shops, historic shops, lively open-air markets and restaurants offer continual surprises to the most demanding tourist. Experiencing Genova is also discovering the several souls that compose it. The nineteenth century neighborhood, the fishermen and vacation villages in the East and in the West part, with houses and picturesque glimpses, and the ones in the hinterland, with their untouched traditions. The stage images and the views, appreciated also as film set, are the frame for an intense cultural life: unique museums, great theatrical and musical tradition, important exhibitions and great international shows, such as Euroflora and International Boat Show. The city of Aquarium offers a lot of activities to whom love the sea: equipped beaches, water sports. The museum offer in Genova is articulated and varied: next to the system of civic museums (Musei del Comune di Genova) there are also two state museums – Museo di Palazzo Reale and Galleria Nazionale di Palazzo Spinola – and several private structures. The network of Genoese civic museums is divided into more than twenty locations and includes: the museums, the archives, the Documentation Center for the history of art and the image of Genova, the specialist libraries and the Didactic Sector, which organizes activities and services for schools and families. The sea, the art, the cultures of the world, science and nature, history and archeology are the thematic routes in which the civic museums are divided. Many factors contributed to the variety of Genoese architecture: the habit to build on existing structures, recycling recovered materials from older buildings, many transformations and extensions of preexisting buildings and churches in times of richness and growth of the city, urban revolutions to improve the road network, the destruction brought by bombings and the following reconstructions. In fact the city was bombed at least in three occasions: the attack from the sea by the French fleet in 1684, the one perpetrated by the Savoia against the independentists in 1849 and the one by the Allies during the Second World War. There is a long history of transformations and high quality architectural and urbanistic interventions that is why architecture lovers will satisfy their desires exploring the city. If you want to travel through the Middle Ages will surely go looking for signs and itineraries in the Historic Centre. 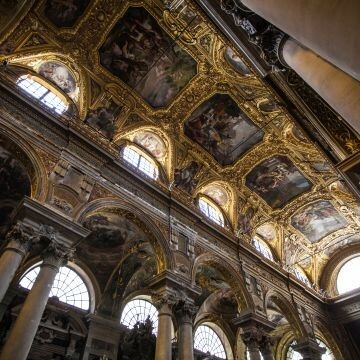 The Baroque style finds its expression in the churches of the Historic Centre, but also in the splendid Palazzi dei Rolli. The ones who love the Liberty style will find elegant testimonies in the straight roads and the tree-lined streets of the Foce, where even Rationalism left its spoor, especially in Piazza della Vittoria and in Via delle Brigate Partigiane. 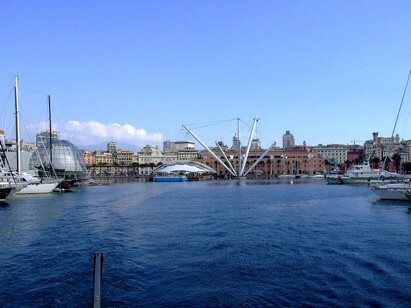 The contemporary architecture lovers cannot miss the Porto Antico restored by Genoese contemporary architect Renzo Piano. The 113 hectares Historic Centre of Genova is one of the most extended medieval Historic Centre of Europe and is the most densely populated. The Genoese Historic Centre is a maze of alleys (caruggi) that unexpectedly end up in small squares, that, as well as the churches that dominate them, belonged to important noble families. The Genoese spirit resides in these alleys, where different smells, flavours, languages and cultures have always been mixing together. The Historic Centre, more of any other part of the city, has always been a melting pot. In these narrow spaces, between the hills and the sea, the pride of rich merchants and of noble Genoese was expressed by building splendid residences, where many works of art were collected and guarded for centuries, and is still possible to see them in some of these palaces, nowadays transformed in public Museums. The architectural styles overlap in these compact ensemble of buildings, where the windows of the house are so close that they can almost touch: the medieval wall is the basis for a 15th century building, the Gothic galleries today have been transformed into trendy clubs. 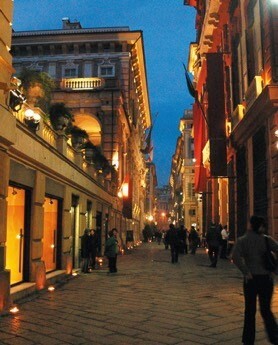 In the Historic Centre of Genova, the past is the foundation of the present. In this place it seems like time has stopped. You can find noble palaces and wonderful churches that alternate with shops that have been open to the public for more than 100 years, where typical dishes are still prepared following traditional recipes and artisanal objects are created according to traditions. Typical of Genova are the “botteghe storiche” (historic shops) and even the names of the alleys often recall a past strongly linked to artisanal activities and corporations, like Via degli Orefici or Vico del Ferro. If you lift your eyes at crossroads, you will enjoy the magnificent votive niches donated by ancient corporations to illuminate the streets of the city at night. The most ancient part of the city can be mostly visited on foot: it is nice to lose yourself in the alleys and stroll in lively areas or choose an organized itinerary to visit and get to know in detail churches, palaces and monuments, maybe even following a fil rouge, such as the Genova of songwriter Fabrizio De Andrè or the medieval city. Panoramic terraces and ancient fishermen villages, small beaches and cliffs, beach resorts and glimpse caught between the walls of a building and a church, the Porto Antico and the promenade designed at the beginning of the 20th century. Genova and the sea have a strong but peculiar bond. The sea is always present in the history of the city and in the background, but if you want to touch the water in the city centre you will have to uncover small passages and almost secret beaches, like Santa Chiara. In a couple of minutes away from the city centre, one precious treasure follows the other and you can find many corners of peace and beauty. Silent oasis where time seems to have stopped can be rapidly reached in a comfortable way thanks to the public transport, by train, by ferry, or, if you prefer, by bike. Vernazzola and Boccadasse, set among small pastel colored houses close to the beach, Nervi, framed in the fascinating promenade that winds along the cliff, Quinto, Quarto, Pegli and Voltri. They are magical places, they smell like dried salt and invite you to relax during every time of the year. During the warm season you will be able to dive into the sea or sunbathe, but also benefit from free equipped beaches or beach resorts. The climate is mild, both in the summer and in the winter, and will allow you to stroll or have a drink on the seashore or have a dinner with a view in one of the many famous restaurants of the area and have the time to taste the local cuisine specialties. « Fragrant kitchens. Here are gigantic pies, chickpea flour, mixtures, sardines in oil, hard-boiled eggs encased in pastry crusts, spinach pies and fried foods ». The poet Paul Valery, in 1925, described with these words the Genoese cuisine. 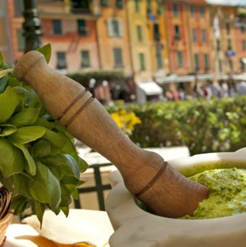 Olive oil, vegetables and aromatic herbs are the basis of the local cuisine, simple and balanced, whose most famous specialties are pesto and focaccia. 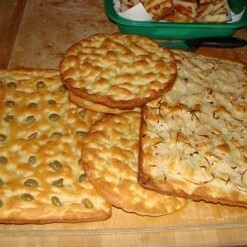 In any restaurant or restaurant of Genoese cuisine you can also taste the stuffed vegetable pies, such as the torta pasqualina, and the Genoese polpettone. Among the first stand out the traditional ravioli “al tocco”, the typical pansotti with the walnut sauce and the Genoese minestrone. To taste also the Ligurian rabbit, the cima, stuffed vegetables and – very common in the local cuisine – the Farinata with chickpea flour cooked in a wood oven and the panissa. There are numerous sea specialties: from ciuppin to the buridda, to the capponada, to the stoccafisso accomodato. Mixed fish fritters can also be tasted in the street food version, they are sold in paper rolls especially in Via Sottoripa. One of the most elaborate specialties is the cappon magro, a scenographic cold multi-layered fish salad. Among the most famous desserts there are: the Genoese pandolce, the castagnaccio, the Lagaccio biscuits, the canestrelli, the « gobeletti », candied fruits and flowers (rose petals, violets) to be tasted with the Cinque Terre Sciacchetrà. The University of Genova offers over 120 degree courses in 11 fields of study distributed over 9 different cities. Many courses and teaching units are taught in foreign language, mainly in English. Students may find here great opportunities, competitive undergraduate and graduate programmes and academic excellence. The University provides student handbooks, guidance services and tutorship to help you with your choice. The University of Genova offers a wide range of opportunities to international students, who choose to attend a degree course, a PhD or decide to take part in the Erasmus+ programme. The international cooperation is one of University of Genova’s main goal and it aims to create academic, scientific and cultural exchanges. The University of Genova plays a leading role in the fields of research, innovation and technology transfer in an increasingly competitive environment at national and international level. 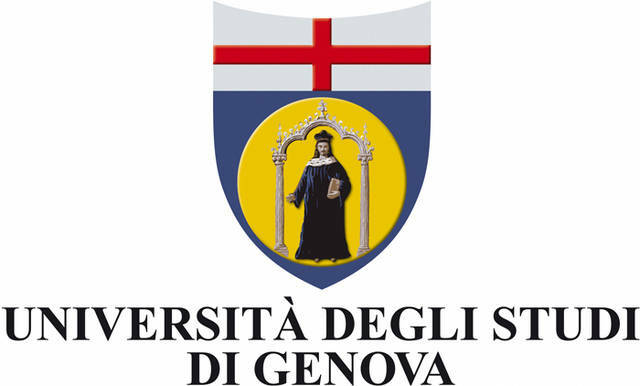 The University of Genova takes part in national and international programmes, it selects funding channels and promotes many relations with local and regional authorities and companies. Departments and University centers carry out scientific researches in collaboration with professors, researchers, postdoc researchers, technical and administrative employees and PhD students of 28 PhD courses. To promote the research outcomes, the University of Genova supports technology transfers to allow companies to benefit from innovations. Patent applications can be submitted to the University, which owns these applications individually or together with companies or other research institutions. 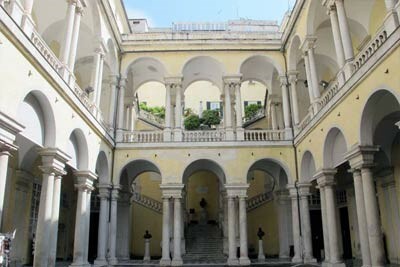 The University of Genova is one of the most valuable cultural and scientific heritage of the Mediterranean and the Italian north-western area. It is deeply interconnected with the city of Genova and its economic framework. The University is located throughout the region, with campuses also in Savona, Imperia and La Spezia. The University Library System (SBA) manages the library’s heritage and offers high-quality services aimed at fostering the knowledge sharing.